A city, a movie star, and one magical year. In November of 1954 a young woman dressed plainly in a white oxford, dark sunglasses and a black pageboy wig boards a midnight flight from Los Angeles to New York. As the plane’s engines rev she breathes a sigh of relief, lights a cigarette and slips off her wig revealing a tangle of fluffy blonde curls. Marilyn Monroe was leaving Hollywood behind, and along with it a failed marriage and a frustrating career. She needed a break from the scrutiny and insanity of LA. She needed Manhattan. In Manhattan, the most famous woman in the world can wander the streets unbothered, spend hours at the Met getting lost in art, and afternoons buried in the stacks of the Strand. Marilyn begins to live a life of the mind in New York; she dates Arthur Miller, dances with Truman Capote and drinks with Carson McCullers. Even though she had never lived there before, in New York, Marilyn is home. In Marilyn in Manhattan, the iconic blonde bombshell is not only happy, but successful. She breaks her contract with Fox Studios to form her own production company, a groundbreaking move that makes her the highest paid actress in history and revolutionizes the entertainment industry. 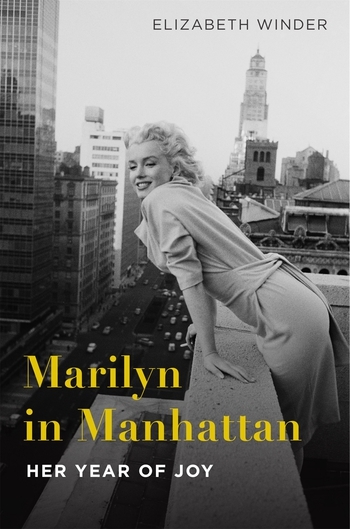 A true love letter to Marilyn, and a joyous portrait of a city bursting with life and art, Marilyn in Manhattan is a beautifully written, lively look at two American treasures: New York and Marilyn Monroe, and sheds new light on one of our most enduring icons. "A glittering, poignant tribute to one of America's most stylish icons as well as it's most stylish city." "A beautifully written glimpse into a year in the life of a complicated, brave woman whose keen intelligence and ambition has been largely overshadowed by her iconic beauty. Winder takes the reader on a fascinating and intimate journey with Marilyn that ends all too soon."